Very important reminder: the tip below will explain how to remove an item from the index, yet this does not prevent it from being picked up during the next crawl (full/incremental). In order to prevent the item from being crawled again additional steps must be taken (such as creating a crawl rule for the item). Big thanks to Mikael Svenson for the reminder! Earlier today I posted an article on Microsoft Learning’s Born to Learn website, and I thought it would be an interesting article for the audience here as well. The article covers how to force FAST Search for SharePoint to remove an item from the index immediately, without having to wait until the next crawl. In the article linked above I showed how to obtain the Item ID (or ssic://<id>) using the Crawl Logs, so here in this post I will show how to obtain it directly through the Search Center. This will also be a neat way to show you how to get the raw XML for the search results, which is very helpful when you are troubleshooting issues with your search results (such as to confirm that some property is being returned properly). 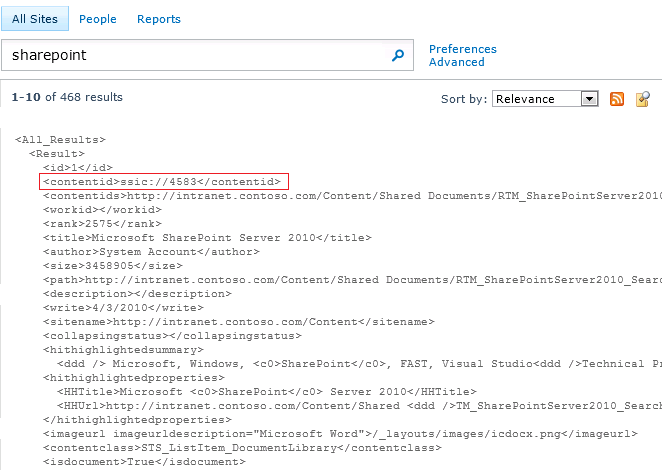 And with that you have a way to remove items from the FAST Search for SharePoint index whenever you need. It does take some work, but at least now you have a way to accomplish that. This entry was posted in FS4SP and tagged delete, docpush, FS4SP. Bookmark the permalink. Nice post, and a very handy trick! Hopefully we will get a fool-proof way of black-listing certain documents in the future, or have them not being indexed based on some arbitrary rule. I know we can use docpush magic today for this, but a bit cumbersome. That’s a great point, Mikael! I completely forgot to add this information while I was doing the post, but I will put an addendum with the reminder that any items removed should also be blocked from being crawled again (either through a crawler rule or any other way). It’s been such a long time (5+ years) since I last did anything with FAST Search for SharePoint that I can’t recall if any easier way to blacklist items was ever added to the software. It does sound like crawl rules (https://technet.microsoft.com/en-us/library/ff473168%28v=office.14%29.aspx?f=255&MSPPError=-2147217396#procedure1) would be the way to go, but they can indeed be quite cumbersome if you have multiple items you want to blacklist, each with their own url pattern. I used to read you blog habitually, I can’t believe I ever stopped! Now I remember what got me captivated overall.